"I put my life on the line ... and they're not going to take care of my medical bills?" (CNN) -- Erik Roberts, an Army sergeant who was wounded in Iraq, underwent his 13th surgery recently to save his right leg from amputation. Imagine his shock when he got a bill for $3,000 for his treatment. Army Sgt. 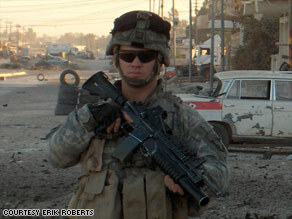 Erik Roberts was badly wounded in Iraq with two comrades in April 2006. "I just thought it was bull---- that I'm getting billed for being wounded in Iraq doing my job. I always put the mission first, and now that I was wounded in Iraq, they're sending me bills," he said. "I put my life on the line and I was wounded in combat, and I came back and they're not going to take care of my medical bills?" It's a level of outrage shared by his mother, as well as the doctor who performed the surgery. "It's hard to understand why we're not taking care of guys like Erik whose injuries are clearly related to their service. They deserve the best care of anybody," said Dr. William Obremskey, an Air Force veteran and surgeon at Vanderbilt Orthopaedics in Nashville, Tennessee. "For him to be responsible for $3,000, I think, is a little ridiculous or is uncalled for, particularly in this situation." His mother, Robin Roberts, put it more succinctly: "Why should any soldier pay one penny of a medical bill from injuries that occurred while they were fighting in a war? That's what really frustrates me." The Department of Veterans Affairs has now decided to pay his bill, but only after prodding from a U.S. senator who got involved after CNN brought it to his attention. Roberts, of Warren, Ohio, is one of more than 31,100 U.S. troops to have been wounded in Iraq. An additional 4,262 have died in the war. Roberts and his buddies, A.J. Jefferson and Luke Murphy, were badly wounded and bleeding on the ground after jumping from the burning vehicle. They were saved by comrades who rushed to help them. "The truck automatically filled with smoke. There was fire coming from the middle of the truck. And I just feel my whole right side just like kind of explode," Roberts said. "I thought at that moment that my life was over, so I started praying." All three soldiers survived the attack, but Murphy lost his leg. Days later, on his 23rd birthday, Roberts returned to the States. He underwent a series of life-saving surgeries, including 12 different ones to repair his fractured right leg. A metal rod was inserted in his upper leg to help the fracture heal. He retired from the Army in October 2007, because of his war injuries, and enrolled in college last fall at Youngstown State University, majoring in finance and minoring in economics. But in December, he says, a golf ball-sized lump appeared on his wounded leg. He says he went to a Veterans Affairs hospital and was told not to worry about it. A few days later, he says, he went to the emergency room after the lump flared up more. A doctor there, he says, told him that the leg was badly infected and that it might have to be amputated. Desperate for help, his mother contacted the Army surgeon who had saved her son's life two years earlier. That doctor referred him to Obremskey, the Vanderbilt surgeon. The Robertses say the VA did not approve of them going outside the system. Erik Roberts says he had no choice -- it was have surgery or potentially lose his leg. "I thought my leg was more important than the usual bureaucratic mess," he said. His leg was saved. The $3,000 billed to Roberts wasn't for the surgery itself. It's a portion of the bill for six weeks of daily antibiotics to prevent the infection from coming back. His private insurance plan picked up the majority of the $90,000 in costs. Roberts has been administering the drugs himself -- up to seven IVs a day, with a nurse coming to his home once a week to check on him. At one point, his mom says, the insurance company suggested the war veteran should be put in a nursing home to receive the round-the-clock antibiotics. "Now why would you want to put an injured soldier who is 25 years old in a nursing home to get IVs?" Robin Roberts said. "He said, 'Send me home and teach me to do it myself.' "
Roberts has also paid for his travel expenses from Ohio to Tennessee for treatment. He fears how much of the $57,000 surgery bill he will owe and how much he might be billed for his emergency room visit in December. His schooling has been put on hold because of his surgery and lengthy recovery. "These soldiers and young men and women fight for our country and our freedom, only to come back to have to fight for their health and their life back in the United States," Robin Roberts said. Dr. Obremskey said it's "frustrating" to hear about cases like Roberts'. He says the lesson from Roberts' story is "pretty obvious." "If they're injured in the service to our country, we should continue to take care of them even if they are discharged from active duty because of their injuries. Some mechanism ought to be available for them to obtain whatever care they need," Obremskey said. CNN on Wednesday contacted the office of Sen. Sherrod Brown, a Democrat from Roberts' home state of Ohio who serves on the Senate's VA committee. Brown's office had not heard of Roberts' case, but immediately reached out to the soldier and alerted the VA about his situation. In less than 24 hours, the VA got back to CNN. "The VA will be paying the bill," said VA spokesman Sean Nelson. The VA did not offer an explanation as to how something like this could happen. Brown's office issued a written statement, applauding the decision. "Sen. Brown is pleased to hear that Mr. Roberts will not have out-of-pocket costs for a service-connected injury. However, he believes it should not take the intervention of a U.S. senator for our veterans to receive the care they've been promised." Roberts said he appreciates the help. Despite everything he's experienced, Roberts -- who went into the Army just after high school -- said he would never trade in being a member of the 101st Airborne. "I will always be proud I served my country, and proud that I was able to wear that flag on my shoulder," he said. "I would defend this country against anyone, and I'm proud to wear that uniform." CNN's Thom Patterson contributed to this story.